India. Gupta. Chandragupta II, ca. 380 to 414 AD. Gold stater. Size : 17.4 x 19.7 mm. Weight : 8.14 grams. Grade : Fine but with flan flaw towards the upper centre where you can actually see light through the coin (a flan crack tht widens at that point). 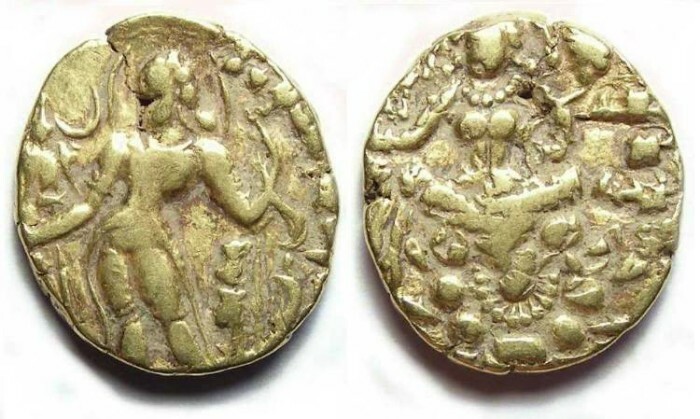 Obverse : King standing forward, holding a bow, with a Garuda standard to the left, with an inscription that reads DEVA SRI MAHARAJADHIRAJA SRI CHANDRAGUPTAH.. Reverse : Lakshmi seated forward with legs crossed, on a lotus with in inscription that reads SRI VIKRAMAH around.